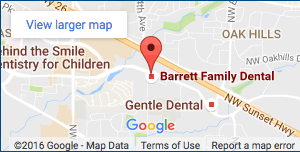 When it comes to family dental in Beaverton, the staff at Barrett Family Dental understands that patients have a lot of questions when it comes to their oral health. By now most of us understand the risks tooth decay and gum disease pose to our long-term oral health, but there are a variety of less common oral condition that can dramatically impact your daily routine and oral health, as well. One such condition is thrush. Thrush is frequently an oral infection caused by the fungus Candida albicans, commonly known as yeast. While Candida infections are not limited to just the mouth – it can appear in other parts of the body and is what causes a baby to develop diaper rash – the condition causes a creamy white substance to develop in the mouth, while also slightly raising lesions in the mouth – typically on the inner cheek or tongue, but occasionally on the tonsils, gums, roof of the mouth or back of the throat. The lesions that develop due to thrush can cause discomfort and may bleed after eating or brushing. Occasionally, the condition can cause a strong inflammatory response in the body. For patients suffering from a compromised immune system, this reaction can become life-threatening. While treatment for thrush is relatively simple for children and adults, the condition is much harder to treat in patients whose health are at the greatest risk – those with weakened immune systems. But now, new research has helped to identify two unexpected substances that might help Dr. Barrett and other dentists better treat thrush and the strong inflammatory response the condition can cause in some patients. Candida albicans ranks as among the most common types of fungus, and it has the ability to grow as either a filamentous or circular form. Human immune cells known as neutrophils try attacking fungus with a variety of strategies, including the creation of web-like structures (NETs) that trap and kill fungus. However, studies have shown that the formation of these types of structures can cause tissue damage and has been linked to inflammatory diseases, such as atherosclerosis (heart disease) and erythematosus (lupus). In order to gain a better understanding of the link between the fungus and the body during an infection, researchers from Umea University’s Department of Molecular Biology created a new technique to compare the filamentous and circular forms in order to accurately study the inflammatory responses caused by NET formations. The researchers discovered two unexpected anti-inflammatory agents – an anti-inflammatory molecule and an antioxidant – that could be utilized to control the inflammatory responses caused by NET formations. Based on the preliminary data from the study, researchers believe that these two agents could be used to create new treatment options for inflammation related diseases caused by Candida infections. This type of breakthrough could prove life-saving for thrush patients suffering from compromised immune systems. The complex inflammatory response caused by Candida has long posed a problem for researchers in terms of understanding how the fungus affected its human host. While the fungus is typically kept in check by other micro-organisms in the body, it can grow out of control under the right conditions, such as those caused by an illness, certain medications, diabetes or smoking. When it comes to family dental in Beaverton, know that the staff at Barrett Family Dental will continue to keep you up-to-date on the latest breakthroughs in oral health so you and your family continue to smile brightly for years to come.